Free SVG Cut Files - Mickey Ears - Sew What, Alicia? I’m guessing since you are here for the Mickey Ears cut files you are probably just as crazy as me and have decided to create your own shirts for your vacation! I designed these files a few weeks ago because I wanted to make custom shirts that were unique. Did you know that there are tons of people at the parks who also have their own custom shirts? Part of the fun of going was checking out everyone’s shirt. I was totally in the dark that creating your own shirts was totally a thing now! Here are two separate free svg cut files for you to create your very own shirts! You will need to be on a computer to download the files, the SVG will most likely not download on your phone or tablet. Click the title of the file you want and the download should begin. These are not for commercial use, these are for your own personal use, seriously don’t sell them or the shirts you make with them. All the vinyl I used was purchased from Expressions Vinyl. They have tons of great vinyl options and it is my favorite place to get my cutting machine supplies. I cut all of my files with my Cricut Maker. Check out my tips for using the Cricut App for using your Cricut Maker with your phone or tablet. The Cricut EasyPress is the BEST way to attach your iron on. See more about that HERE. These photos were taken at the park with the Memory Maker. I highly recommend the small additional cost for the photo pass! There are so many photographers around the parks and you never know which photos they are going to add a fun surprise to (like the one below.) They didn’t pay me to say that, I am not affiliated with Disney in any way, it is just my honest opinion. These Star Wars shirts were seriously the hit of the park. We got SO many compliments it was unbelievable. I had cast members ask me repeatedly if I sold them in an Etsy shop. No I don’t btw. I would much rather give you all the file so you can make your own that try and create them and ship them and deal with complaints! Ha. This cut file can be used on a single piece of iron on. When I made our shirts I had just seen the adorable shirts that Kimbo from Girl and a Glue Gun had made and I had to copy her idea to use strips of colorful iron vinyl as my backdrop. For iron on and cut file tips check out THIS post. Have you made your own custom shirts with free svg cut files? Share with me in the comments below. Love love love this for my next Disney Trip, but is there anyway to get this file in a PNG? There is a link to a PNG here in the comments. Shelly, you are so welcome! Just be prepared to get a ton of compliments! People were staring at the Star Wars shirts all day when we wore them! Super cute. Going to a Star Wars themed baby shower. I know what I’m making. Thank you. Thank you so much for these files. My nephews LOVE the Hidden Mickey/Star Wars file. Btw, did you know someone is selling this same file on Easy? I hope it’s you. If not, I wanted to let you know. Etsy! Not Easy. Autocorrect got me again. Thank you so much for this file. I am making them for a coworker and her family, they are going to be thrilled!!! I really appreciate the free file, you are very generous and crafty!!!!! Now time to plan my Disneyland trip so my family can use them too. Your family photos are priceless!!!! 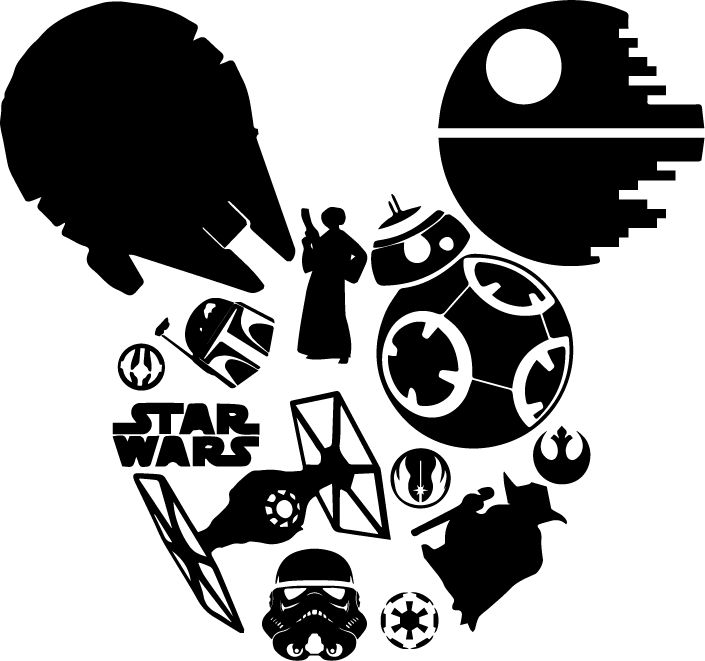 Thanks for the diy file, going to make the star wars shirts for our Disney trip in February. Thank you!! How cool! Can I use it for a t-shirt? Ooo! These are so fun. I’m adding them to the list of ideas for our next trip.